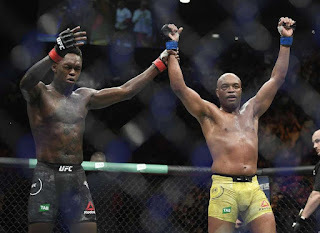 Adesanya and Silva Put On "Fight of the Night"
It wasn't the main event we thought we'd get, but Israel Adesanya and Anderson Silva made sure the fans went home happy with a tremendous fight that won both men a $50,000 bonus. Adesanya had a lot of respect for Silva and it showed during the fight, but both guys still put on an awesome performance. If anything the stock of both fighters went up, with Adesanya possibly leapfrogging Gastelum for the next title shot at 185 lbs, and Silva likely looking at a big fight his next time out. 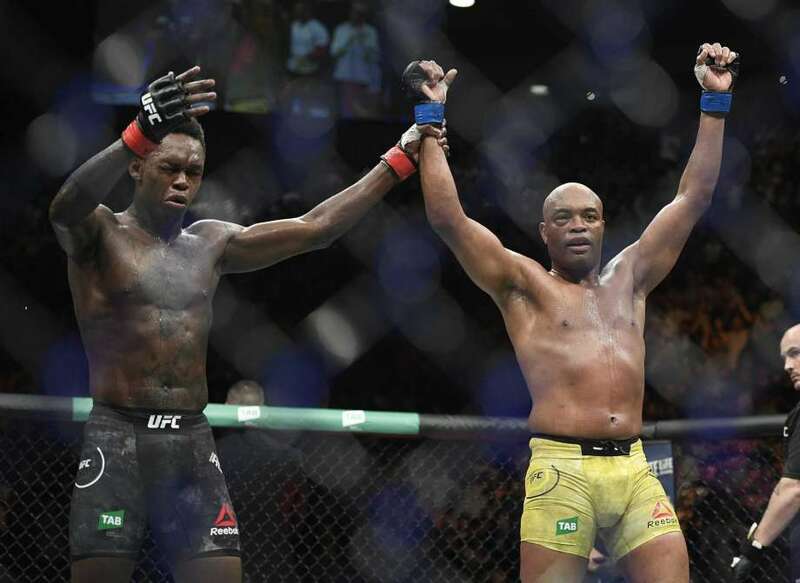 • Israel Adesanya vs. Anderson Silva: Israel Adesanya def. Anderson Silva via unanimous decision (29-28, 30-27, 30-27). One of the better fights on the card saw Ricky Simon pull off the biggest win of his career with a decision victory over Rani Yahya. Simon showed that he has the wrestling skills to neutralize a grappler like Yahya and the striking skills necessary to beat him. The UFC bantamweight division is quietly one of the most exciting weight classes in the promotion, and Simon looks like a good one. Speaking of good ones, Montana De La Rosa appears to be a future contender for the women's flyweight title after her second-round drubbing of Nadia Kassem. De La Rosa has an incredibly dominant ground game, and if he can shore up the rest of her skill set, she could soon make a run for the Top 10 at 125 lbs. For her next fight she called out Paige VanZant, and the UFC should book that one. • Montana De La Rosa vs. Nadia Kassem: Montana De La Rosa def. Nadia Kassem via submission (armbar) at 2:37 of Round 2. It wasn't how he wanted the fight to end, but Jim Crute did what he needed to do to force a first-round stoppage over veteran Sam Alvey. Just 22 years old, Crute is now 2-0 in the UF and a perfect 10-0 in his MMA career. Even if referee Marc Goddard stopped the fight a bit early, it's still likely Crute would have won anyways. The sky is the limit for this young Aussie fighter in a wide open UFC light heavyweight division that is desperate for future title contenders. For his second straight fight in the UFC, Devonte Smith picked up a quick knockout win, this time over Dong Hyun Ma. Smith earned a 50K "Performance of the Night" bonus for the finish, and if he keeps winning fights in this kind of impressive fashion, he'll get a top-15 opponent in no time. We still have no idea what's going to happen with the UFC men's flyweight division, but Kai Kara-France is doing a good job of helping the UFC to keep it around. 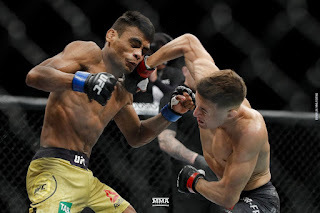 The local Oceanic native won his second straight fight in the UFC with a split decision win over Raulian Paiva, and it was an excellent matchup to boot. • Kai Kara-France vs. Raulian Paiva: Kai Kara-France def. Raulian Paiva via split decision (29-28, 28-29, 29-28). Deep on the prelims there were two exciting finishes worth mentioning. In an exciting slugfest at bantamweight, Kyung Ho Kang finished Teruto Ishihara, and in a lightweight contest, Jalin Turner knocked out Callan Porter. Turner won a 50K bonus for "Performance of the Night," while Kang should have received one himself, but either way, both men have set themselves up for a exciting matchups in their next respective outings. There's no doubt UFC 234 was a weaker event than most of the other cards we've seen recently, but at least the fighters on the card put on good performances and tried to make up for the lack of star power. Let's just hope now we don't have a last-minute hiccup next weekend before UFC on ESPN 1. UFC 234: Adesanya vs. Silva (formerly UFC 234: Whittaker vs. Gastelum) took place February 9, 2019 at Rod Laver Arena in Melbourne, Australia.